A Little Murder, at the Manor [Download] - �99 delivered. A 6 player version of Murder at the Manor - same murder but with six all-new suspects! 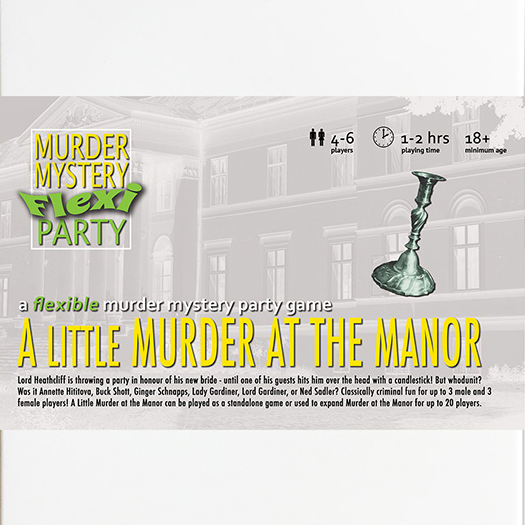 Play it on its own or add it to Murder at the Manor to accommodate up to 20 guests! You抮e invited to Heathcliff Manor, where Lord Heathcliff is hosting a small, intimate dinner party to celebrate his recent marriage. But before anyone can toast his happiness, Lord Heathcliff is killed with the candlestick in the pool room. Host your own party to find out who snuffed out his candle! * Play with ANY number or combination of 4-6 suspects. This game was very good and you were very helpful in getting this game to me via E-Mail. I'M sure that I will be back again some when.